Traditional US allies are among a growing chorus condemning President Trump's decision to recognise Jerusalem as Israel's capital. Saudi Arabia called it "unjustified and irresponsible", while France and the UK said they did not support the decision. But Israeli PM Benjamin Netanyahu hailed it as "historic" and said he was sure more countries would follow suit. President Trump's move reversed decades of US policy on one of the thorniest issues between Israel and Palestinians. 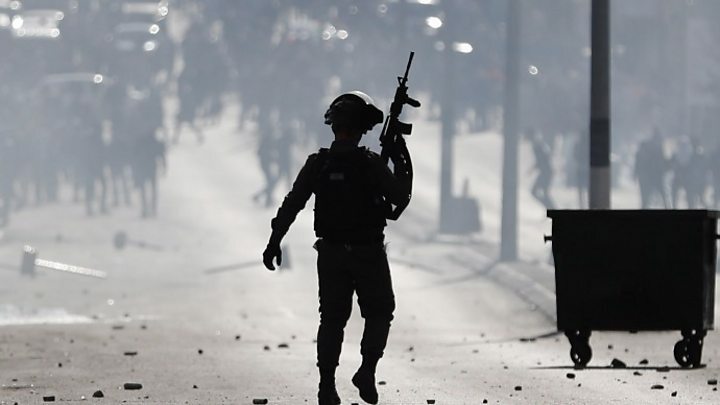 Hundreds of Israeli troops have been deployed to the West Bank amid a day of protests and strikes by Palestinians. The Islamist group Hamas has called for a new intifada, or uprising. Palestinian President Mahmoud Abbas has called for support from the UN Security Council and the Arab League, both of which will hold emergency sessions in the coming days. 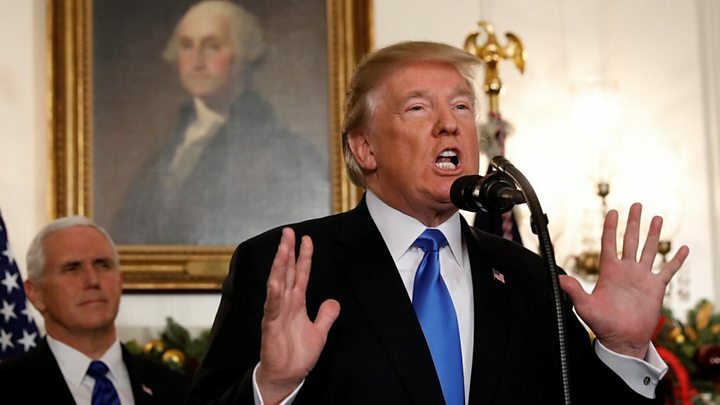 The US president said on Wednesday that he had "determined it is time to officially recognise Jerusalem as the capital of Israel". "I've judged this course of action to be in the best interests of the United States of America and the pursuit of peace between Israel and the Palestinians," he said. Mr Trump said he was directing the US state department to begin preparations to move the US embassy from Tel Aviv to Jerusalem. Despite warnings of regional unrest over any such move, the decision fulfils a campaign promise and appeals to Mr Trump's right-wing base. Recognising Jerusalem as Israel's capital was "nothing more or less than a recognition of reality", he added. "It is also the right thing to do." Mr Trump said the US would support a two-state solution - shorthand for a final settlement that would see the creation of an independent Palestinian state within pre-1967 ceasefire lines in the West Bank, Gaza Strip and East Jerusalem, living peacefully alongside Israel - "if agreed to by both sides". The president also refrained from using Israel's description of Jerusalem as its "eternal and undivided capital". The Palestinians want East Jerusalem to be the capital of any future Palestinian state. What do Israel and the Palestinians say? Benjamin Netanyahu said Israel was profoundly grateful to Mr Trump, who had "bound himself forever with the history of the capital". He also said Israel was "in touch with other countries to follow suit. I have no doubt other embassies will move to Jerusalem - the time has come." He did not name any of these countries, although the Philippines and the Czech Republic have been singled out in Israeli media. The Republican Jewish Coalition thanked the president in a New York Times ad. The mood was very different on the Palestinian side, with a day of strikes and protests planned. The leader of the Islamist movement Hamas, which dominates Gaza, called for a "day of rage" on Friday and said it should "be the first day of the intifada against the occupier". "We have given instructions to all Hamas members and to all its wings to be fully ready for any new instructions or orders that may be given to confront this strategic danger," Ismail Haniya said. Meanwhile, Mr Abbas' rival Fatah movement is seeking to protest through diplomatic means, by filing a complaint to the UN Security Council and pushing for a strong stance by the Arab League. "We are going to declare the United States disqualified as co-sponsor of any peace process or political process," spokesman Dr Nasser al-Kidwa said. "In our mind, it has lost its ability to do or perform any efforts in this regard." What does the rest of the world say? The Arab and the wider Muslim world - including a number of US allies - condemned Mr Trump's announcement. Demonstrations broke out outside the US consulate in Istanbul, Turkey, and in Jordan's capital Amman. 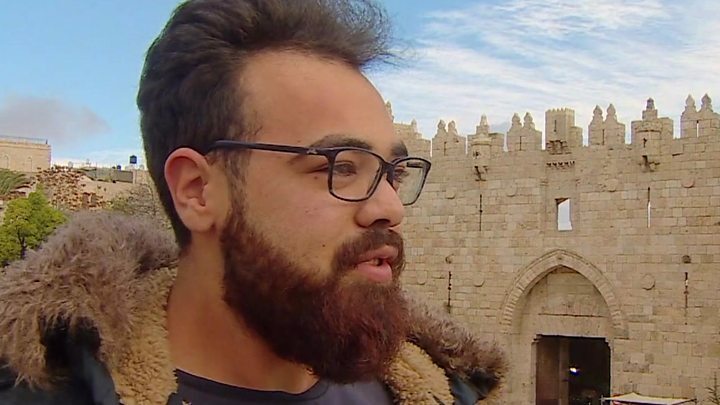 Palestinians turned off Christmas lights in the West Bank city of Bethlehem, the traditional birthplace of Jesus. Turkey's President Recep Tayyip Erdogan said Mr Trump was "throwing the region into a ring of fire". "What do you want to do Mr Trump? What kind of an approach is this? Political leaders exist not to create struggles but to make peace," he said. Top Iraqi Shia cleric Grand Ayatollah Ali Sistani said the move "hurt the feelings of hundreds of millions of Arabs and Muslims". Which countries condemned Trump's move? The Saudi royal court said it "represents a significant decline in efforts to push a peace process and is a violation of the historically neutral American position on Jerusalem". UN Secretary General Antonio Guterres said it was "a moment of great anxiety". "There is no alternative to the two-state solution," he stressed. British Prime Minister Theresa May said she disagreed with the US decision, which was "unhelpful in terms of prospects for peace in the region"
EU foreign policy chief Federica Mogherini voiced "serious concern"
Why is the announcement significant? Mr Trump's announcement puts the US at odds with the rest of the international community's view on Jerusalem's status. Because of its importance to both Israel and the Palestinians, its final status, according to the 1993 Israel-Palestinian peace accords, is meant to be discussed in the latter stages of peace talks. What are the alternatives to a two-state solution? Israeli sovereignty over Jerusalem has never been recognised internationally, and all countries maintain their embassies in Tel Aviv. Jerusalem contains sites sacred to the three major monotheistic faiths - Judaism, Islam and Christianity. 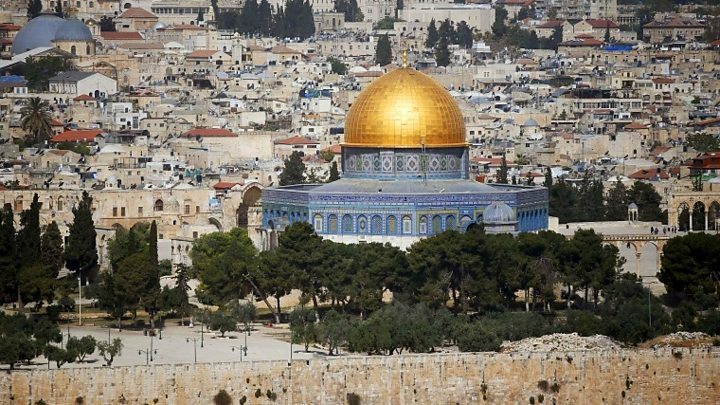 East Jerusalem, which includes the Old City, was annexed by Israel after the Six Day War of 1967, but before now it has not been internationally recognised as part of Israel.